Monogeneric family: characters as for genus. The family was created to accommodate the genus, which is anatomically intermediate between Halimeda and Codium. Thallus erect, comprising holdfast and branched cylindrical or compressed axes. Anatomically comprising a core (medulla) of siphons that produce a cortex of swollen, adherent branches (utricles) that are polygonal or hexagonal in surface view. Six species are currently accepted (Guiry & Guiry 2017): one of these is found on our south coast. Thalli erect, dark green, somewhat flaccid, cylindrical at base, 1-3 mm wide, compressed distally, dichotomously branched up to 8 times. Utricles tightly adherent and more or less polygonal in surface view. Spherical gametangia develop from the medullary siphons (Coppejans et al. 2005). Common in lower eulittoral, rock pools, sublittoral fringe and shallow sublittoral. Found from East London through to northern KwaZulu-Natal (41-58). South Africa, Mozambique, Madagascar, as well as subtidally in Oman and Western Australia (De Clerck et al. 2008). Type locality: Isipingo Beach, near Durban (De Clerck et al. 2008). 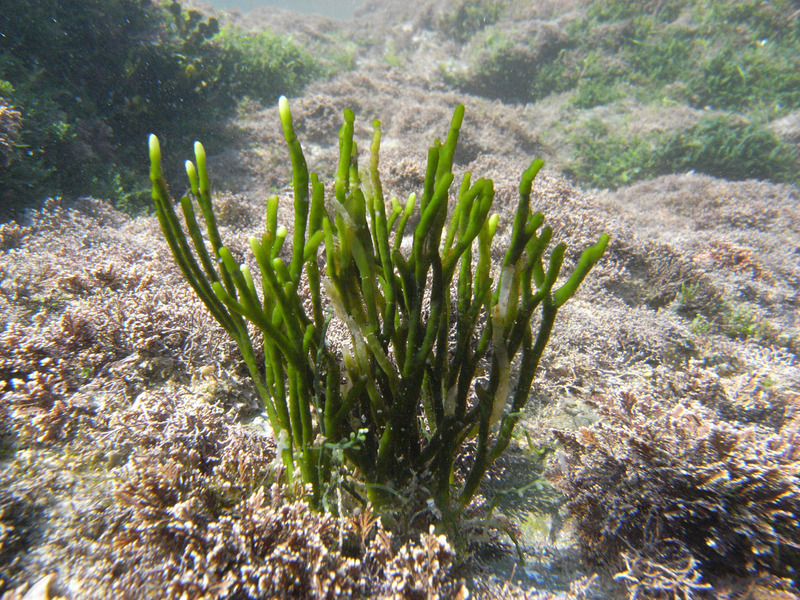 Pseudocodium devriesii, Double Mouth, habit. 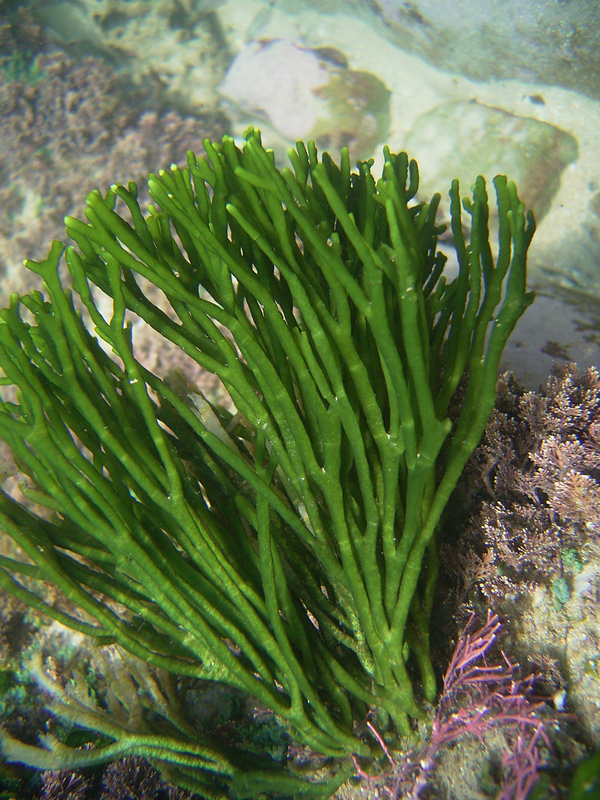 Pseudocodium devriesii, Double Mouth, showing branching pattern. M.D. Guiry in Guiry, M.D. & Guiry, G.M. 2017. AlgaeBase. World-wide electronic publication, National University of Ireland, Galway. http://www.algaebase.org; searched on 17 May 2017. Weber-van Bosse, A. (1896). On a new genus of siphonean algae - Pseudocodium. Journal of the Linnean Society of London, Botany 32: 209-212, Plate 1.